The Saint-Isidore parish was founded in 1875 by Father Louis Gagnon. The church in baroque style was designated provincial historic site in the year 2000. The remarkable elements of this church are the hardwood trims in maple and a lot of plaster ornaments covered in gold. It is also considered the most beautiful church in the province. 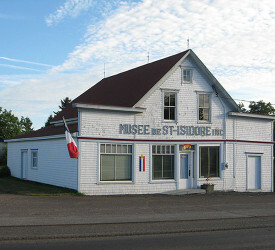 The Musée de Saint-Isidore is located in an old general stone built in the year 1910. You can find an exposition of ancient objects related to farming, forestry, crafts, religion, education and commerce at the Musée de Saint-Isidore.